Home Clothing Need Shooting Clothing For Game Season? We’ve Got It Sorted! We are moving into the much anticipated months of gamebird season where grouse, pheasant and partridge are the talk of the field. For most avid shooters, and I’m sure they would agree, the only down side to shooting season is the uncomfortable wet weather and Jack Frost constantly nipping at your fingers, nose and toes. As any keen shooter will know, the autumnal dress code for the gamebird season is tweed; it’s the go to attire. Tweed is sure to keep you exceptionally warm when you’re out hunting in frost laden fields. Introducing the new and improved Musto Stretch Technical Tweed, this jacket is a Musto breadwinner when it comes to popularity and practicality; thanks to its extremely lightweight design and outstanding woollen weave. What’s so special about the weave I hear you ask? Musto have combined nylon fibres into their Teflon® coated wool blend to give the jacket a more advanced overall durability, so that the wearer is protected from any harsh brambles. Not only is the wool combined with nylon fibres, it has also been intertwined with Lycra fibres. The threads of incorporated Lycra will provide the individual with unlimited fluidity of movement, due to its elasticated properties (which is extremely easy on the shoulders when you’re continuously mounting your gun throughout the day). This jacket is perfect for hunting in all types of weather as it has been designed to be waterproof, windproof and breathable. 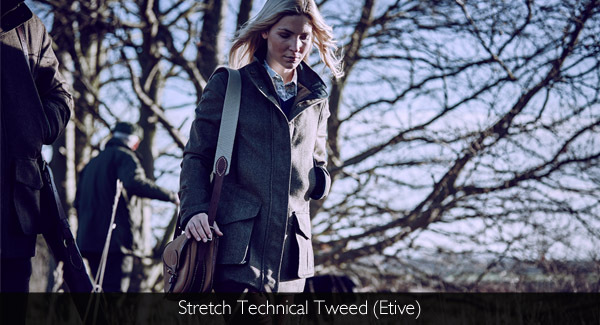 Ladies, it’s time to wrap up nice and warm with the Musto Ladies Stretch Technical Tweed. 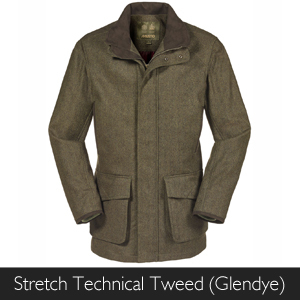 This particular jacket is incomparable to other Musto Tweeds as it bears numerous desirable qualities. This particular coat has exceptional heat retaining properties as a result of being made from a blend of Scottish lambswool, featuring ribbed cuffs, a moleskin lined collar with microfleece lined pockets (perfect for fending off the kisses of frosty weather). Also both nylon and Lycra have been combined within the wool mix to enable you to have greater freedom of movement and an overall stronger garment. Lastly this jacket has extremely practical features with its fitted sizeable cartridge pockets, internal security and poacher’s pocket. Thanks to its Teflon® coating this jacket is also waterproof, windproof and easy to clean. Is Water Weighing You Down? Looking for the perfect game shooting jacket that isn’t tweed, but has the same qualities? 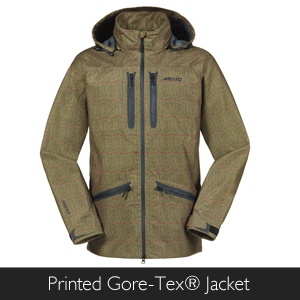 Then take a look at the Musto Printed Gore-Tex® Jacket. 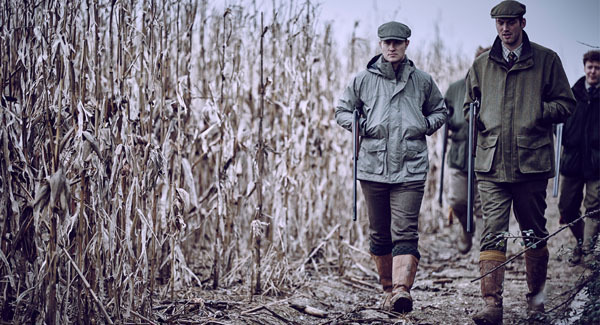 Inspired by the notorious tweed attire of game shooting season this coat is extremely lightweight and protective in rainy conditions thanks to its 100% waterproof Gore-Tex® material (ideal for when you’re trudging about in muddy fields!). This jacket is also 100% windproof and breathable due to its clever Gore-Tex® lining, making it a perfect all-rounder for both hot and cold weather conditions. Most importantly this jacket has been modified with a stunning tweed print that will have you fitting in with the rest of your group in no time. During game shooting season it is equally important to protect your legs as well as your torso. Musto’s Printed Gore-Tex® Breeks are completely breathable and waterproof, and help the wearer maintain a regular body temperature. You may not want to buy a jacket just for the game shooting season; you may want a coat that you can take with you to any shooting event. If you are familiar with the trusty Barbour Berwick jacket then you will know how much of a spectacular shooting coat it is. Introducing the Barbour Bransdale, which is a whole new kettle of fish! The remarkably lightweight Barbour Bransdale has taken inspiration from the Berwick and is a perfect jacket for all sporting occasions; with its supreme waterproof droplining middle layer and 100% polyester and drip strip sleeves. This coat is both windproof and breathable, so you are sure to be protected in all types of weather conditions. Featuring two front bellow pockets with a stud flap (perfect for storing cartridges), and a high collar to keep the icy wind off of your neck. The fully waterproof and breathable Ladies Barbour Bishopdale is a brand new addition to the AW15 range that has been designed with game shooting season in mind. 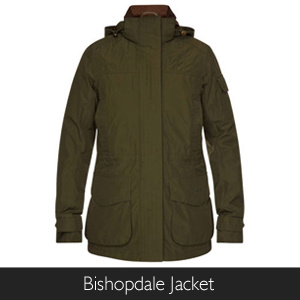 The Bishopdale is an impeccable shooting jacket with its fantastic waterproof and temperature regulating characteristics. This jacket is made from 100% polyamide, which will keep you nice and toasty in the winter, and as cool as a cucumber in the summer. Plus as a result of its robust polyester outer material you are sure to be protected against angry thorns and snagging branches. Now you’ve heard of the prize winning Musto Fenland Packaway Jacket that was presented the winner of the “New Clothing Product” award, right? 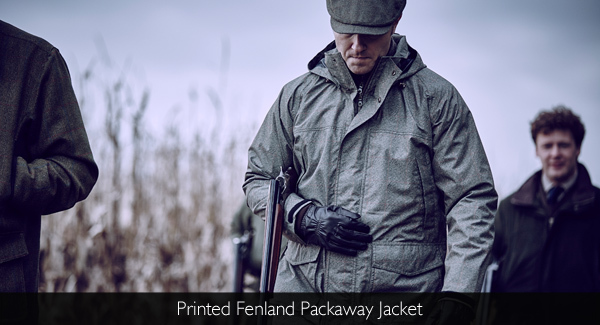 Well, meet its little sibling the extremely lightweight BR2 standard shooting jacket; the tweed Printed Fenland Packaway. 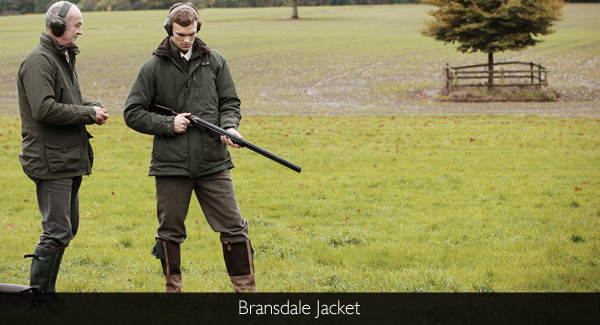 This high quality sporting coat is also a shooters best friend in the field thanks to its extremely useful flap retainer straps on the cartridge pockets, and it’s highly favourited packaway capabilities. So, when you are out on the move you no longer have to worry about towing around a huge coat, simply pop it in your holdall and off you go! Plus this lightweight polyester jacket is also 100% waterproof, windproof and breathable, which is perfect when combating the autumnal elements. What is a BR2 Jacket? BR2 is Musto’s way of assessing a fabric’s waterproof capabilities. BR2 fabric can withstand a minimum hydrostatic waterhead of 10,000 mm and a maximum of 15,000 mm. 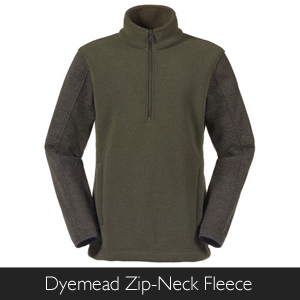 The brand new Musto Dyemead Zip Neck Fleece is a perfect addition to any shooter’s wardrobe for AW15. 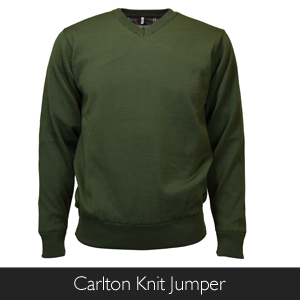 This jumper will make you feel as snug as a bug in bitter temperatures with its fantastic technical knit and polyester/cationic fleece body, technical knit arms and Lycra binding cuffs. You may think “great it keeps me warm, but it must be uncomfortable to move around in?” the answer is no, even with all of its warming features this fleece has been designed to offer the wearer supreme comfort and freedom of movement. A water resistant jumper? Really? Yes, really! The soft, lightweight, Barbour Carlton Knit Jumper is made from 100% extra wool that has a unique Teflon® coating, which gives it its water resisting qualities. With its elasticated cuffs and hemming the stingingly cold wind is forced to stay away whilst keeping you nice and toasty in cold conditions. 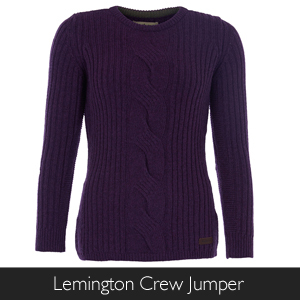 The highly stylish Barbour Lemington Crew Jumper makes a superb body warming middle layer with its 5 gauge knit of cosy lambswool. Featuring a beautifully designed cable and ribbed knitted pattern this jumper will look stunning either out in the field or at a casual dinner party. Stylish or practical? 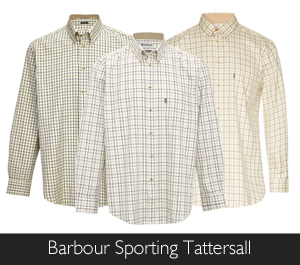 Whatever the occasion both the Musto New Check Shirts and Barbour Sporting Tattersall Shirts have got your back! Both ooze class and sophistication. Each shirt is made from luxuriously soft 100% cotton and is tailored with a handy chest pocket. 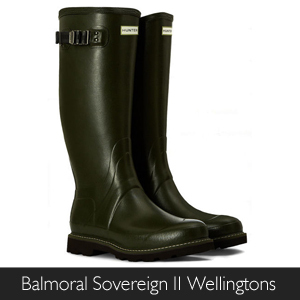 The Hunter Men’s Balmoral Sovereign II Wellington has come back new and improved for 2015. This time they have been modified with Newflex Vibram® soles and commando cleats, which are perfect for all types of hard wearing terrains. These wellington boots are extremely lightweight and flexible (so they won’t tire your feet out on long hiking sessions). Most importantly these boots have been tailored with a leather lining, which will help you keep your feet cool in the summer and pleasant in the summer. 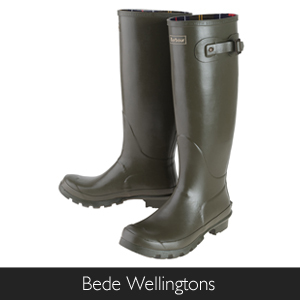 The Barbour Ladies Bede Wellington personifies a more modern and more advanced version of the classic Barbour boot. These highly fashionable wellies offer ultimate comfort and protection with their vulcanised rubber uppers and non-slip sole. So whether you are slogging through a wet and muddy field or just out on a midday country walk you are protected against the elements. Featuring a beautifully designed classic Barbour twill tartan lining and a sturdy adjustable calf strap. barbour, Breeks, Country Shirts, Game Season, GORE-TEX, hunter, Jumper, Musto, New Season Clothing, shooting, Shooting Jacket, Waterproof Clothing, wellington boots. Bookmark.